Join us in celebrating Sharon Kelly and Crystal Beshara in their explorations of the sensory and atmospheric influences of bodies of water. Kelly builds up tone and texture to symbolically show water's effect on the psyche. Beshara examines her own experiences with water as she paints scenes of coastlines from around the globe in her signature style blending watercolour and oil paint techniques. Crystal Beshara will also be presenting her signature floral works, for which she has received numerous accolades, including an induction into the Canadian Society for Realism in Watercolour and the Society for Botanical Artists. 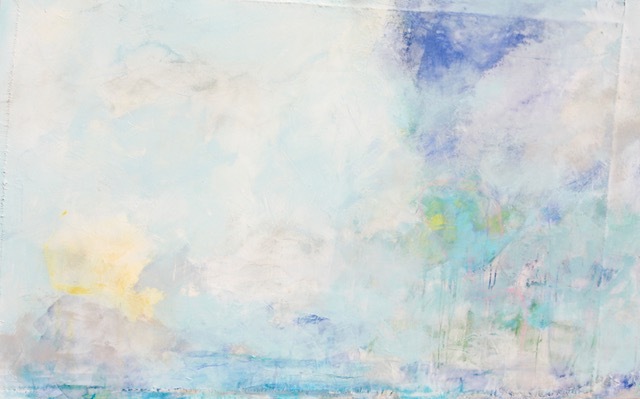 Sharon Kelly, Through the Mist, acrylic and mixed media on canvas, 60" x 30"
Crystal Beshara, Rambling Rose, oil on canvas, 24" x 24"